Summer is long past and the short, turquoise-tinted June nights already feel like a long time ago. But the night skies of summer are somehow far less well known to me than those of winter, so at this time of year I feel the tilt of the earth brings with it more familiar markers in the heavens: the return of Orion, Taurus, Bootes and Canis Major seem to return an order to my relationship with the sky and as Cygnus takes his place directly overhead I feel more completely orientated in the darkness. These patterns were burned into my memory from such an early age I can’t even remember a time when the winter sky wasn’t populated by these figures. And of course, during my early years, consideration of the sky was totally bound up with my awakening interest in the past. To me these patterns are now as fixed and immutable as if they were punched out of the blackness, letting through light lying beyond the darkness. But we know this seeming permanence can only be observed from the perspective of the fleetingly short human life. The slow-grinding Newtonian gears have shifted our perspective of the heavens over the course of even the past few thousand years and the stars our earliest human ancestors saw were subtly different: some hadn’t yet come to be and others have long-since turned to scattered cosmic dust. Studying human origins means my research doesn’t really give me the opportunity to explore the relationship of past peoples with the cosmos. This is much easier in later prehistory where we can clearly identify astronomical alignments and cosmological belief systems in the archaeological record. Within the Upper Palaeolithic there are glimpses of astronomical observation perhaps, but even here too much assumption is necessary to do more than invoke emerging animist belief systems and time-frames tracked by astronomical observation. Deeper in time we run into a wall, where even scraps of tangible data are absent, and for all we know our earlier ancestors hurtled through space on their evolutionary journey with the night sky as nothing more than a stunning, crystal clear and unobserved backdrop. But let’s just consider for a moment another perspective on our evolutionary relationship with the night sky, one in which instead of trying to track back from modern cosmological belief systems into the past, we consider the evolutionary conditions for that path to emerge in the first place. I have always felt that paradigms in which ancient beliefs are considered a forerunner to modern scientific understanding is short-sighted, self-serving and ultimately unscientific in basis. If we are to really track the trajectory of human understanding we need to understand the adaptive advantages that underpin mythological thinking in the first place and secondly identity the cognitive building-blocks which allowed that thinking to emerge. I therefore find it hard, from an evolutionary point of view, to consider the mythological Dream-times and complex cosmologies as simply cultural memes, place-holders waiting for the arrival of scientific explanations. The paradox of current anthropological thinking is that a lot of weight is placed on the appearance of symbolic thinking emerging in the last 100,000 years without much consideration as to advantages which directly underlie the appearance of this complex thinking in the deeper past. So let’s shift our focus way back for a moment and consider a point in time 2 million years ago, a period in which our genus Homo has already developed in Africa, perhaps as a group of closely related bipedal, tool using scavengers and perhaps before or around the time of the first dispersals of Homo outside of Africa. This is a period with an archaeological record limited to simple stone tools and animal bones bearing tool cut-marks, early Homo brain sizes aren’t really much bigger than those of Chimpanzee’s and no one is seriously considering that their cultures had any complex symbology or language use. Early Homo is unlikely to have been nocturnal, the open grasslands and lake-edge environments being dangerous places to a primate with poor night-vision and sense of smell. But unlike forest-dwelling apes, these populations did have an incredible view of the night sky, if only perhaps before and after they bedded down in their nesting sites. 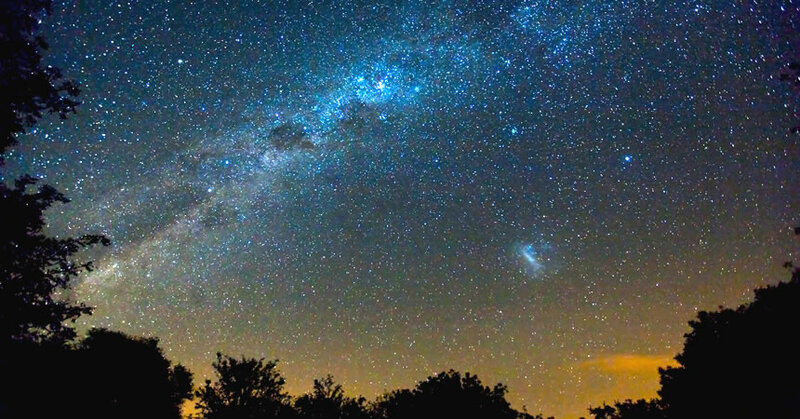 This view, unobstructed by light pollution or chemical haze, was a constant, daily presence shared by all human ancestors across millions of years, so perhaps we should begin by asking a simple question….when in our evolutionary journey were hominins first conscious of the night-sky and able to recognise patterns within it? I’ve pegged 2 million years for a reason, the report earlier this year that astronomers have established the supermassive black hole at the centre of our galaxy underwent a major eruption at precisely this time gives pause for thought. The image of a night sky over the feeding grounds of our hominin ancestors, erupting with a spectacular cosmological event, is an arresting one for any palaeoanthropologist, but I’d like to ask the following question: did early Homo notice or pay attention to it? It’s unanswerable of course, but that doesn’t mean we shouldn’t consider it. It’s the sort of question which might be a loose thread we can tug at, pick at and tease out, and perhaps reveal something significant about how we, as a genus, interact with our environment at a cognitive level. Understanding the initial conditions of interaction between the hominin brain and the natural environment, might be a way into understanding the emergence of more complex symbolic and mythological thinking; cognitive and cultural frameworks that underpin shamanic, animist, religious and, ultimately, scientific thought. Primates are great at pattern recognition, and as this video shows chimpanzees out-strip us in recall of patterns to a remarkable degree. Given this cognitive skill-set and the apparent unchanging configuration of the night sky within human timescales, I don’t believe it is unreasonable that the appearance of a new, bright light in the heavens wouldn’t have caught the attention of early Homo. Of course there were certainly no words, no explanations, no mythologizing to accompany this recognition, but is it too much to suggest there might have been wonder or anxiety? Fixed patterns which change within fixed limits each year might well have been encoded within hominin brains as a ramp of normal conditions. Such encoded maps of the distribution of terrestrial resources, raw material, shady trees and scavenging areas would have had a profound adaptive advantage, as would recognising any sudden change in terrestrial conditions which might be a threat (eg. Rising smoke, approaching flood water, suddenly appearing black monoliths). Were celestial patterns equally noted and encoded. The primate predisposition for pattern recognition and mapping would have been of immense advantage to hominin species which were mobile, fragmenting as a group on a daily basis and extending their range. It’s therefore easy to invoke mechanisms whereby these cognitive abilities were actively selected for, and we ultimately know that these self-same skill-sets were at some point extended to the heavens. So I’m simply posing the question, when might have this begun? and at which point in our evolutionary journey did this pattern recognition become co-opted for both functional adaptations such as tracking time and position in terrestrial space as well as later frameworks for mythological systems?, the two almost certainly being deeply entwined. With this deeper evolutionary perspective in mind, let’s jump forward to the slightly more solid ground, but still data-poor record, of our own species during the past 100,000 years. We know that human cultural complexity by this time is almost certainly generating and maintaining magical/religious belief systems which we might term shamanic or animist in nature. The star fields hanging over an increasing global population of modern Homo sapiens is possibly becoming richly encoded with mythological content, names, elaborate patterns recognition and transmission of knowledge. This is a period in which we find the first claims for an emerging understanding of stellar and lunar rhythms, including the controversially claimed lunar calendar from the Abri Blanchard, Sergeac. While terrestrial Dreamtimes might be encoded with information necessary to the daily problems of navigation, territoriality and resource question, these are localised, regional and over thousands of years subject to change. The night skies however are shared by entire hemispheres, and change on much slower circuits than the rhythms of our planetary climate cycles. To encode the stars, with ancestral knowledge, with the temporal rhythms of monthly, annual and decadal cycles, with the mythologies of supernatural entities, is to encode a matrix of fixed points, addresses and locations which are far more immutable, more easily shared and more spatially extensive than any terrestrially based landscape mythology. So as the comet Ison enters our skies next month, consider the innumerable passings of these travellers during our evolutionary journey, and how, along with occasional super nova they create punctuated disruptions of otherwise fixed patterns in the sky. Our human minds have a deep prehistory of reaching out to the stars and embedding information within them, the success of which is based upon the fact so little changes within the skies and they offer a near permanent medium in which to encode the cognitive hyperlinks to ancestral knowledge. The lines we draw between these fixed points are so much more than unconvincing attempts to draw pictures in the sky, they represent encoding of externalised knowledge, a celestial data-network needing only clear vision and clear skies to access.